This is a 5-night, 6-day workshop. Your adventure begins at 10 a.m. on June 9 and ends after a final slideshow by 5 p.m. on June 14. As with all National Parks at Night Passport Series workshops, we will teach at this location only once. 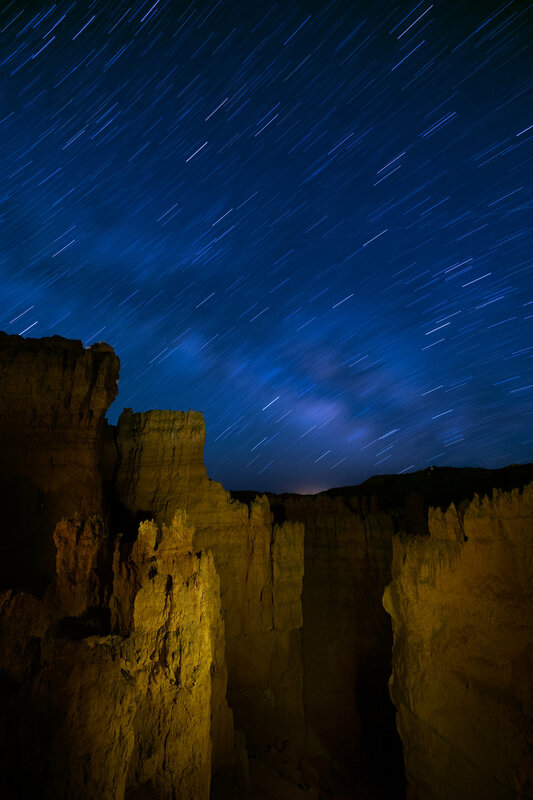 If you have a dream of making epic long exposures at night at Bryce Canyon National Park, we hope you join us. Balance of $1,250 due on March 11, 2019. Last day for a cancellation request is March 10 (see cancellation and refund policy). Both Tim and Matt absolutely love the Desert Southwest. Throughout their careers they have made countless trips to the Red Rock Country of the Colorado Plateau that spans the Four Corners area of the southwestern U.S. While it’s hard to single out an individual park as a favorite, Bryce Canyon is certainly within the top levels of their list. The huge rock spires called “hoodoos” (some as high as 200 feet) are the main feature of Bryce Canyon. Their varied colors and myriad shapes make up the largest grouping of hoodoos in the world. 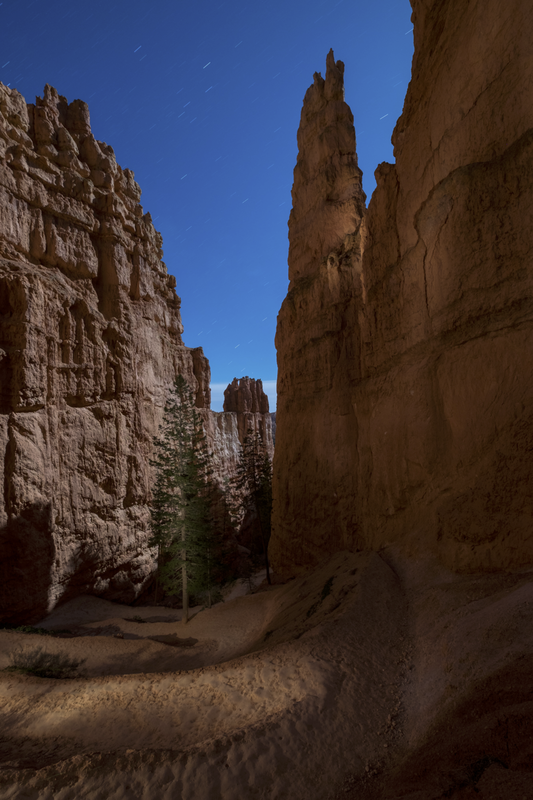 While the majority of images you see of Bryce are taken above the sculptures from the rim of the canyon, we’ll also venture down inside to explore the trails, trees, shapes and colors from below. 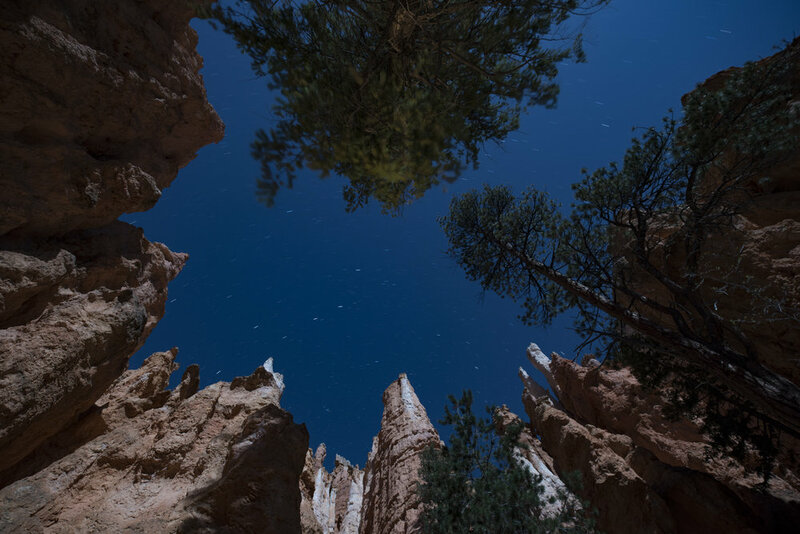 From the canyon floor, the magnificent rock walls, trees and pinnacles pierce the night sky. The near silence amplifies the sounds of a raven’s wings to the volume of a jet. The high elevations, coupled with near zero light pollution will provide us with a canopy of stars that inspire both awe and creativity. 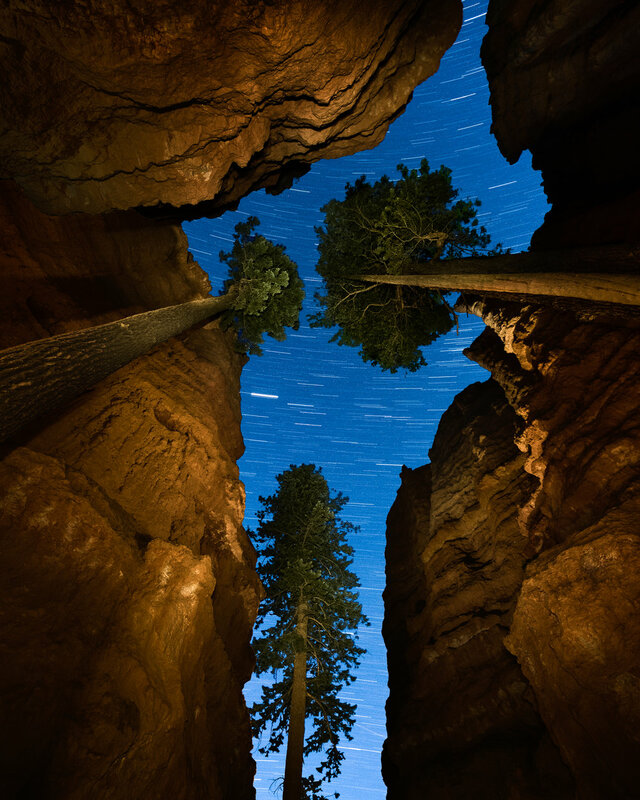 Bryce Canyon is a magical place to spend a week of wonder, insight and tranquility. To ensure we get to some of the best locations, we’ll be hiking on high-elevation trails with steep drop-offs. Many of our hikes will begin with the 500-foot descent into the canyon and end with the 500-foot ascent out of the canyon. Most of the hikes will take place at over 7,500 feet of elevation. Folks with bad knees, weak hearts and bad backs should really consult a doctor before attending. Here is a link to a description of the typical trails we’ll be hiking. Hiking poles should be considered for those with balance issues. You’ll go home after the workshop with a solid grasp of shooting the landscape under moonlight and starlight. Milky Way shooting, star trails and star points will all be explored. You are responsible for arranging and paying for your own meals and accommodations. A group hotel will be announced after registration. If you are interested in sharing a room with another participant, let us know and we will try to connect you with someone like-minded in the group. Due to Bryce Canyon’s high-elevation climate, weather and temperature can be highly variable. That being said, summer days tend to be quite pleasant, with daytime highs in June typically in the high 60s to low 70s. Nighttime lows, however, average in the mid 40s. Recommended attire: Bring a base layer and warm winter coat, as standing around in these low temperatures can make you quite cold. As always, layer your clothing so it’s easy to remove when hiking and to put but back on while standing. Being a photography instructor, I get to see a lot of photographs. Many of them shots of our country’s most iconic locations. I have seen a million photographs of the Grand Tetons, Delicate Arch and of course sunrise over Bryce Canyon. Sometimes this abundance of images makes me feel like I have already visited the place and dampens my enthusiasm for an actual visit. This is the way it was for me until I actually made it to Bryce Canyon. Wow, how misguided I was. The classic view over the amphitheater is simply amazing. But there is so much more. After exploring the rim and hiking down into the canyon I realized how wildly interesting and unique this park is. The towering orange rock spires and clear skies are an incredible combination. I immediately knew this was a perfect location for a photography workshop. Day or night!